Wow... what a fantastic night of music and a great crowd. When I left at 4 in the morning my head was in a different world. I had never heard Hjerteka'se before. They are a pretty new band and consist of a few members from the old band Fæbledyr. We all met at the rehearsal room at 5. I was very excited as the band had invited me to play with them on some numbers. The van arrived about 5:45 to pick up the gear and we loaded it up and Thomas and Stefan went with me in my car and Tommy with the van driver, Jonas. 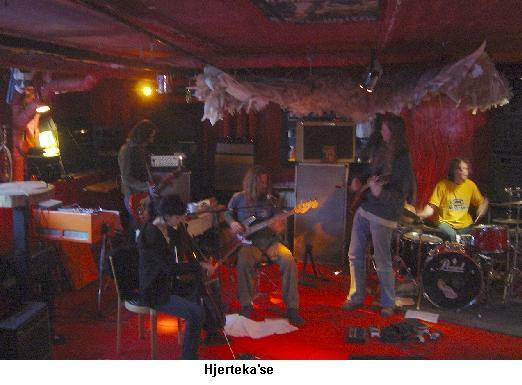 When we arrived, Hjerteka'se were rehearsing and it sounded pretty cool. 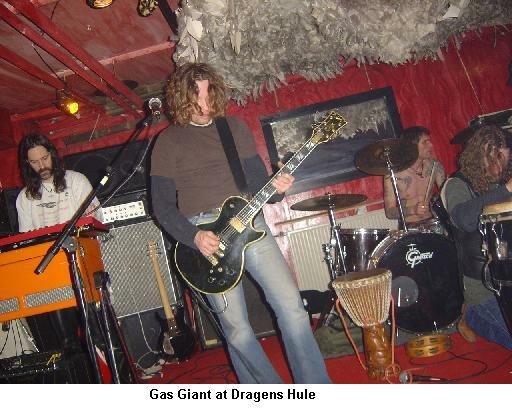 There was a long discussion and beers and more beers and joints and finally it was decided to rearrange their gear so Gas Giant’s could be set up at the same time and then a free form jam started up with Stefan and Tommy from Gas Giant and the two guitar players from Hjerteka'se. Thomas, bass player from Gas Giant, he was not set up for about 10 minutes into the jam and then he joined in. Wow... what a cool 30 minute jam it was. I recorded it. Anyway, people started showing up around 10. I went back home about 8:45 and ate some food and picked up my wife, Lani. There were quite a lot of people now and Hjerteka'se started about 10:40. They played a long and variable set for over 90 minutes. The opening jam song was very cool with a long guitar solo. The vocals are all spoken word and in Danish (I am told very interesting lyrics) but the majority of the music is instrumental. They had some very cool interesting songs with parts that reminded me of a less stoned version of Furekåben, a very spaced out Danish band from the early 70’s. They also have a Kraut rock feel to them as well. The last encore song was a very long jam with a fantastic guitar solo from, Bjørn. It took a little while to move some of the other bands gear and get us set up but soon it was really crowded in the Dragens Hule and people were ready to freak out! We hit the stage around 13:00 and Jesper and Stefan were really tired. Thomas and Tommy seemed a bit fresh. I was pretty much feeling well but not sure what my role would be in the evening. The band did not really have a set list but started with Never Leave This Way and I played the wind lines I used to. It was a really long jam for nearly 17 minutes. The band was pretty loose on this night and played some of the songs in not a very tight manner but found some really special magic in the jams. That was what this night was all about. The jams. After the hard rocker, There’s One, we went back out into space with Green Valley. Stefan played some very emotional guitar. Back On The Headless Track was next and a pretty far out and intense version. It dwindled down into nothing and then a new riff appeared and Jesper started singing some lyrics and a new song started. Quite a cool thing. Stefan just went head first into Mama Cool next and the house was rocking. I mixed in a few synth sounds in the mid section as an experiment. Jesper said we were going to take a break but it did not happen. Stefan started up Storm. This was the highlight of the show with the 23 minute jam on Storm Of My Enemies and a long spaced out jam with some incredible guitar loops, spaced synth sounds, sweeps, grooves, it had everything. Far out stuff. I thought the band was finished but Thomas started the bass wah for Sit Down and it was heavy as hell. Damn, the band was incredibly loud tonight. Everyone said it was brain numbing loud. We ended the set with Too Stoned and that is how everyone felt as well. Amazing night.